can get information useful for living a happy life in Higashihiroshima City. Tuesday class of ITSUDEMO NIHONGO will start soon. Wireless Internet connection services (Wifi) are available. You can get the password at the information counter. non-Japanese residents living in Higashihiroshima. ・work　※ Job placements are not available. ※ We are not able to accompany you to medical institutions. ・electricity、water、gas、shopping, banks, driving licenses, internet, etc. ２. Books, Magazines, Newspapers, DVDs and etc. You can read books, magazines and newspapers from overseas and borrow some of them for free as well. Some popular Japanese movies and DVDs featuring Japanese culture are available. 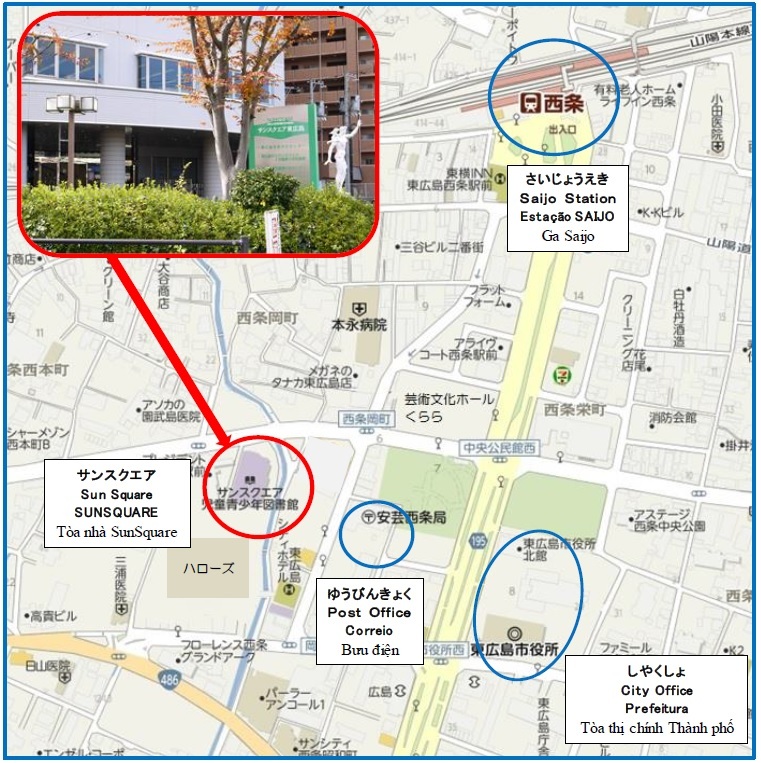 Leaflets and maps of Higashihiroshima City, Hiroshima City and surrounding areas are available free of charge. The Higashihiroshima Monthly City Newsletters in English, Chinese and Portuguese is available free of charge. （３）Self-service printing service is also available. Click here for more details. The classes are taught by professional Japanese instructors and volunteers. Apply at the Communication Corner.Click here for more details. Apply at the Communication Corner. Click here for more details. Wai Wai Japanese conversation classes are supported by our Japanese language coordinator and volunteers. Applications are not required in advance. Apply at the Communication Corner. ・Foreign and Japanese residents of Higashiroshima can communicate with each other in Japanese on a one-to-one basis. to bring together a volunteer and a foreign resident. ・No qualifications regarding Japanese language teaching are required to become a volunteer. ・You can register yourself as a International Communication Volunteer at the counter. ・There are several groups of activities as shown below. You can choose fields which you are interested in. ・Volunteers receive requests for cooperation with events, invitations for workshops, etc., from us or HIC (Hiroshima InternationalCenter in Kagamiyama ,Higashihiroshima City). ・Workshops and lectures for volunteers are held by experts in multi-cultural societies or Japanese language pedagogy, in order to back up our vounteers. We recommend that those who have participated in those training sessions join the Sunsquare Japanese classes and Japanese Conversation Classes. ※If you wish to receive information regarding all events held by HIC (Hiroshima International Center), you need to register yourself as a volunteer at HIC. ・『Higashihiroshima Monthly City Newsletter』(English, Chinese and Portuguese versions are available) can be sent by email to your PC or mobile phone each month free of charge. This completes your registration. You will not receive a reply email from us to inform you of the completion of your registration. ・For those who have registered their PC address, 『Higashihiroshima Monthly City Newsletter』in PDF and the summary in text format will be sent. ・For those who have registered their mobile phone address, only the summary of the『Higashihiroshima Monthly City Newsletter』 in test format will be sent.